Since it was relaunched in 2008. the host of the IFPA World Championship has alternated between the USA and a European country. 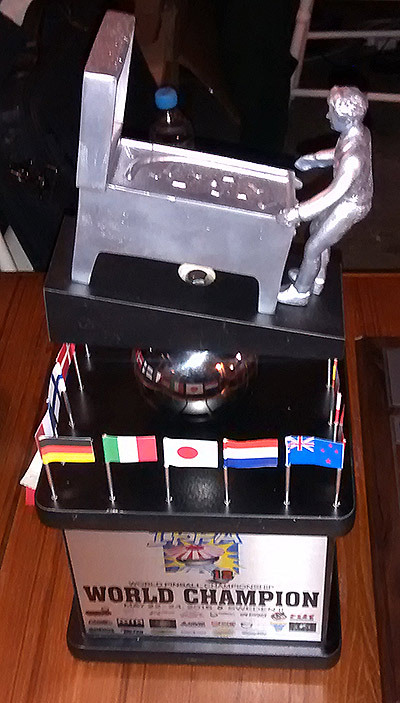 After last year's event in Denver, the tournament crosses the Atlantic for 2015 to the city of Borås in Sweden. 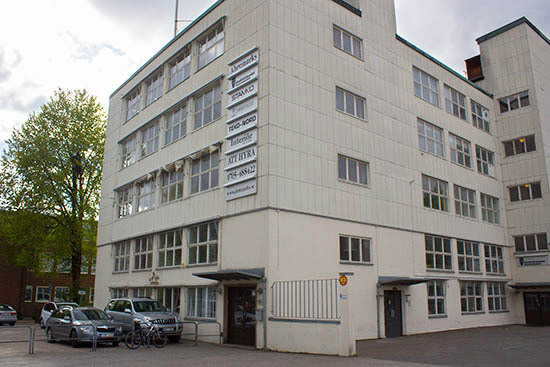 A short walk away from the centre of the town on Göteborgsvägen is an inauspicious-looking office block. 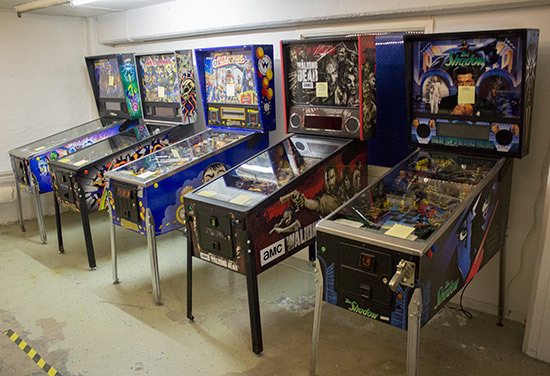 When we arrived at 5pm on Thursday evening, there was no indication we had found the home of Christian Holmsten's Pinballseye or the venue for the IPFA World Pinball Championship. Within an hour, all that had changed. Once inside however, it was clear we were in the right place. 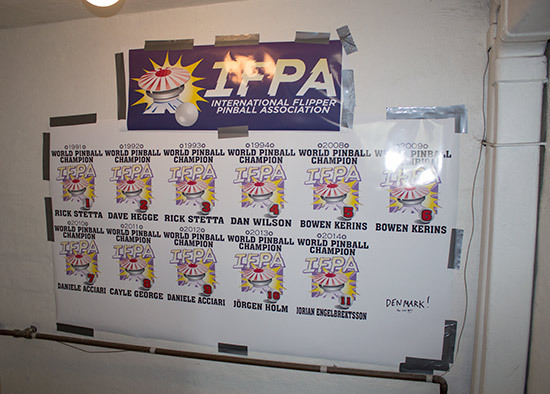 Posters showing the previous IFPA World Championship winners along with the results of the play-offs and the Epstein Cup adorned the walls. 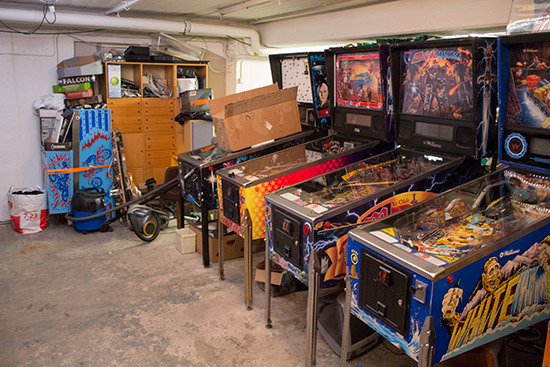 At the bottom of the stairs was the entrance to the basement floor and Pinballseye. 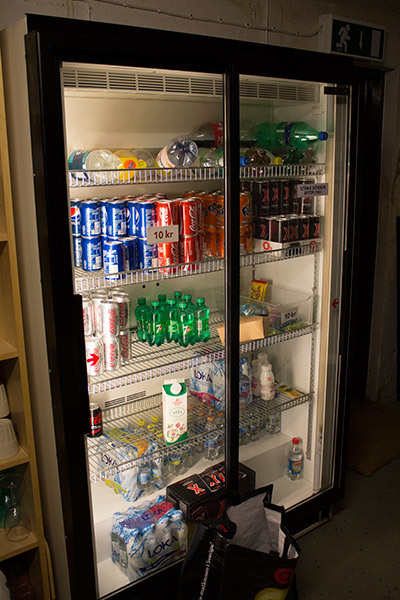 Some seating was available, along with a refrigerator containing soft drinks, milk, energy drinks and bottled water. Cans and bottles were priced at 10 Swedish Krona ($1.18/€1.08/£0.76), as were cups of coffee and tea which were available on the adjacent sink unit, together with hot dogs and cups of soup. 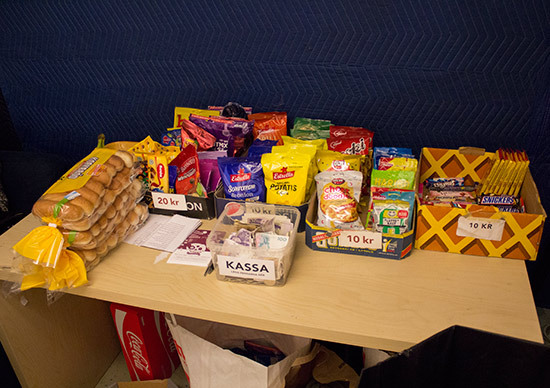 Chocolate bars, fruit and other assorted snacks were on the table opposite, priced at either 10 or 20 Krona. An honour system was used to take payment, which everyone appeared to respect. 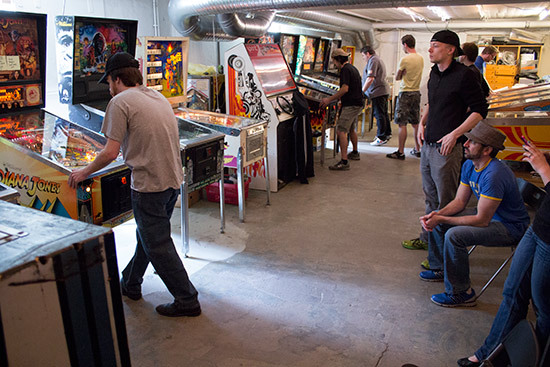 As you enter further inside Pinballseye you came to the first of the pinball and video games. 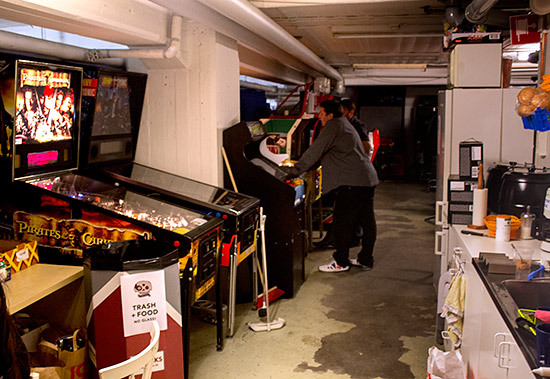 Coat racks and driving games were at the end of this row, while a left turn took you into the main body of the room where the tournament desk was set up along with another fridge serving beer and cider in cans at 20 Krona each. 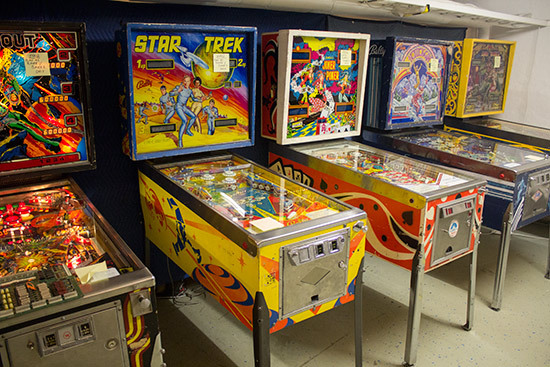 From there, pinball machines could be found in various rows and side rooms. The machines were divided into three age groups - old, mid and new. 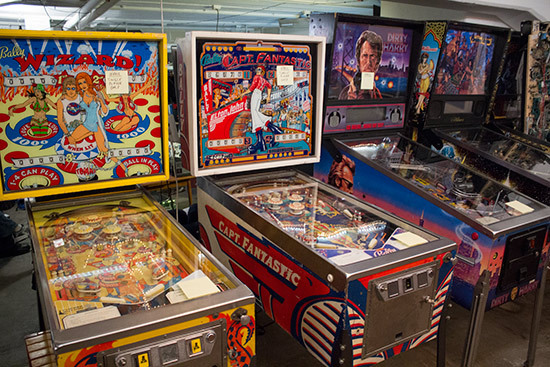 Pinballseye has a large number of dot matrix machines but fewer older games, meaning the definition of what was considered 'old' and 'mid' was stretched a little. 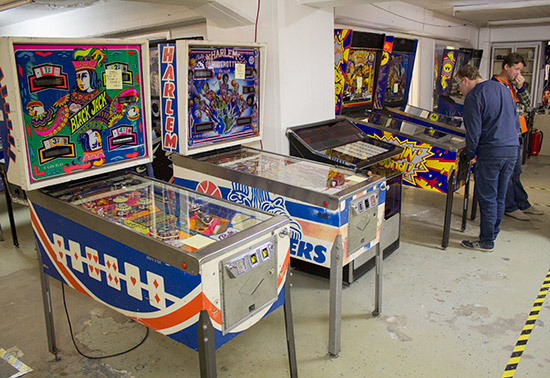 However, nobody seemed to mind, and everyone was pleased to have such a nice selection of great-playing machines. 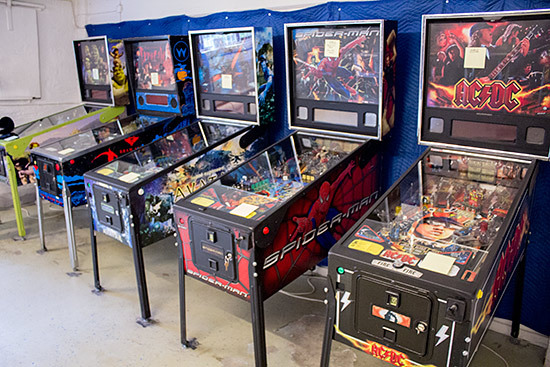 As you will probably have spotted, Pinballseye is not a plush showroom or a pristine game room. It very much has the feel of a domestic basement. 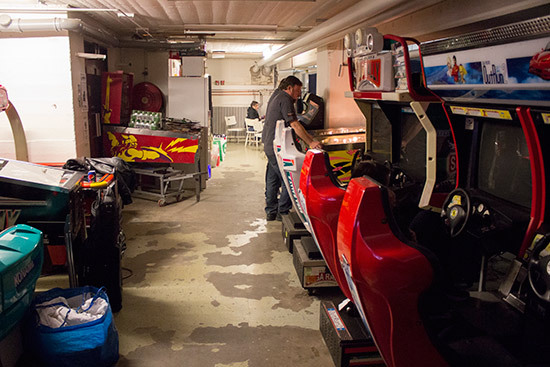 Pipes run across the ceiling, the floor is a little rough in places, and there are boxes of game parts, workshop equipment and paperwork scattered around and tucked under the machines. 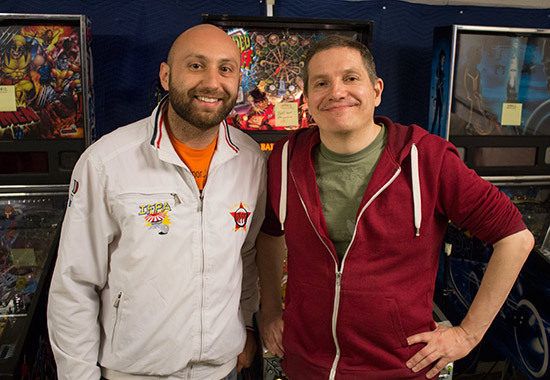 But the 64 players in the World Championship were here to compete and not to admire the decor, and for that Pinballseye was a great location. The World Championship didn't begin until Friday morning, but there was plenty to do on the Thursday night. For instance, the Epstein Cup tournament between a US team and a European team took place. The US won last year on American soil, so the European team were keen to regain the title. The European team consisted of Daniele Acciari, Franck Bona, Jorian Engelbrektsson, Jorgen Holm, Paul Jongma, Mats Runsten, Robert Sutter and Michael Trepp. Playing for the US were Trent Augenstein, Adam Becker, Cayle George, Bob Matthews, Jon Replogle, Josh Sharpe, Zach Sharpe and Cryss Stephens. 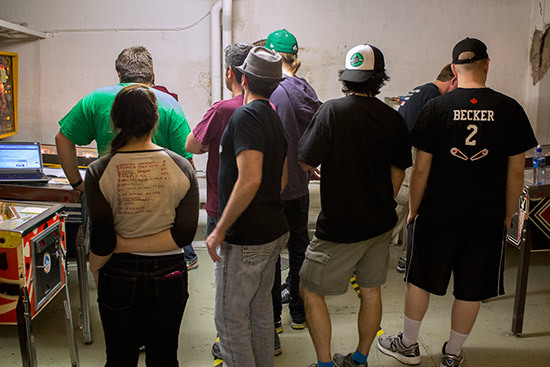 The eight players in each team were split into two pools, and further split into pairs. 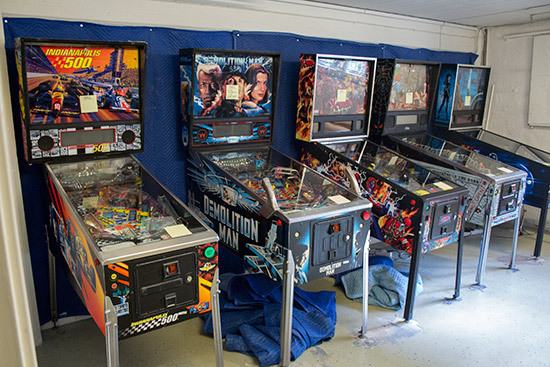 A pair from one team played a corresponding pair from the opposing team in four-player games on three machines. The winner of each game scored 7 points, with 5 points for second, 3 points for third and 1 point for fourth. The second pairs in the same pool then did the same, and the total points from both matches were added together. 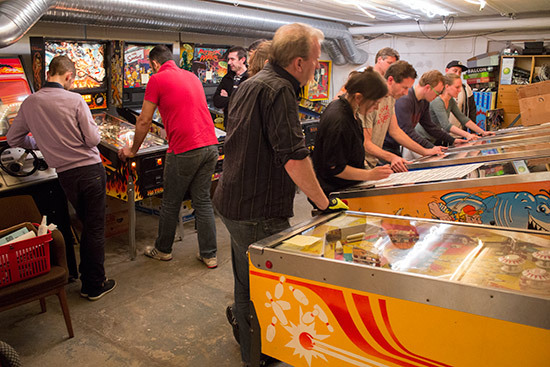 A bonus point was awarded for getting the most points in a match, and an additional 5 points were given for winning overall on each machine. 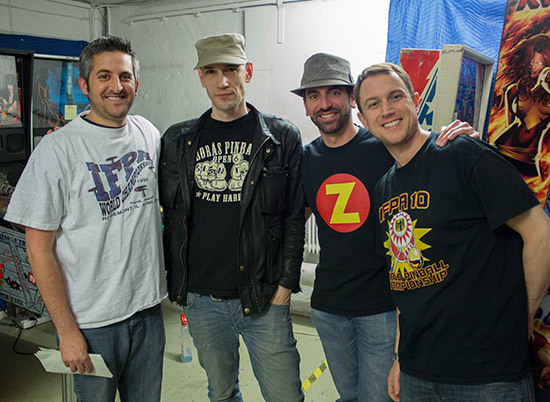 When both pools had played their three machines, the total of all the points earned decided the winning team. 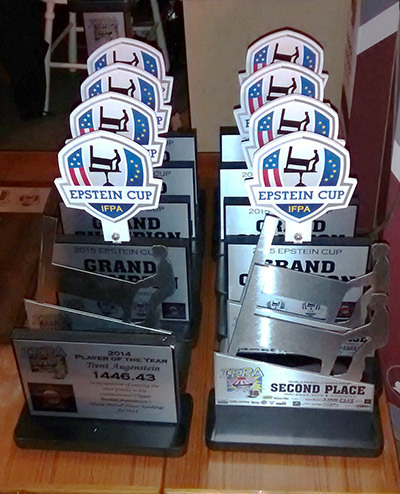 When all the games had been played the US had retained the Epstein Cup by a 10 point margin of 122 to 112. While the Epstein Cup was taking place, the remaining World Championship players could take part in the Thursday Limit Turmoil tournament. 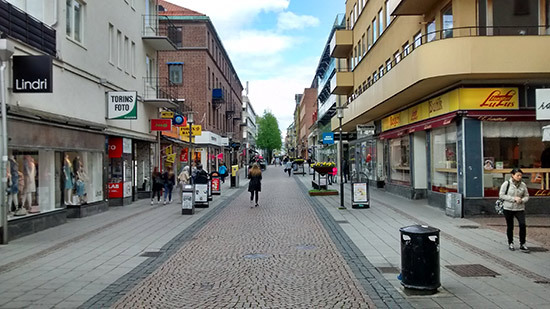 The Swedish Open had been held the previous weekend, and there had been tournaments held nightly since the Monday before the Championship weekend. On Monday it was the Monday Night Knockout, followed by the Tuesday Classic Bally Battle, and the Wednesday Bogey Warriors. 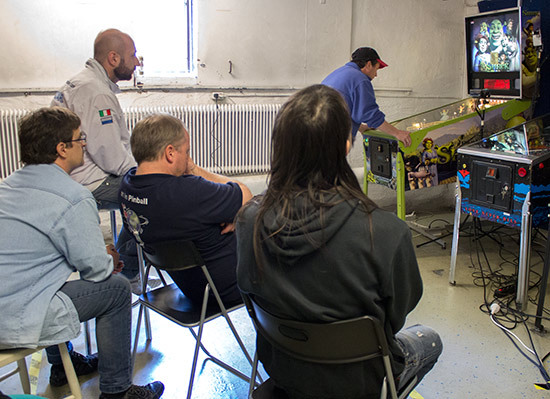 Thursday's event involved a pingolf format where contestants played 12 non-Championship machines twice, having a mix of score and feature objectives on each. 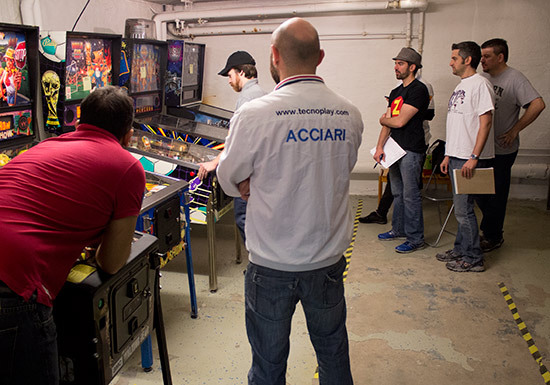 Play was in pairs and points were awarded for reaching the score levels, with bonus points for achieving the features such as starting multiball or playing all the modes. 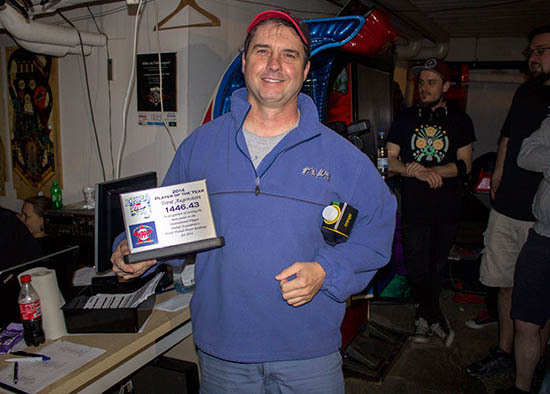 It was a little ambitious to expect everyone to play 24 pairs games in one evening, so the tournament was extended across the entire weekend, with players submitting their score sheets as soon as they were completed. At the time of writing the results of the Thursday Limit Turmoil tournament had not been announced. 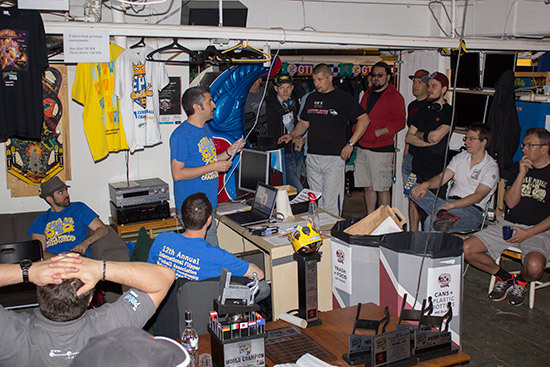 Friday morning saw the start of the main event - the IFPA World Championship. The 64 players were raring to go, but first they trooped outside for the customary group photo. Then it was down to business. There were eight qualifying rounds in total - six on Friday and two on Saturday. 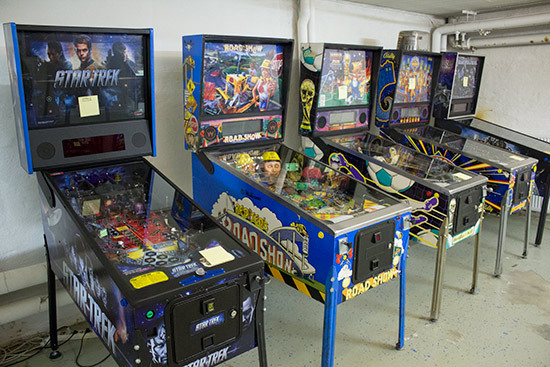 Players were divided into groups of four according to their IFPA ranking, and had to play 4-player games on three machines - one 'old', one 'mid' and one 'new'. Points were awarded according to the finishing position in each game, with 7 points for the winner, 5 for second, 3 for third and 1 for fourth place. 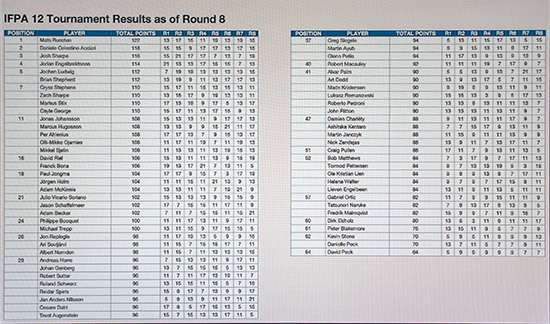 So the maximum in each round was 21 points (three first places) and the minimum was 3 points. The first group was composed of the top-ranked, the lowest-ranked and the two middle-ranked players. The next group took the second-ranked, the next-to-bottom-ranked, the one-above-the middle-ranked and the one-below the middle-ranked players, and so on for the subsequent groups. 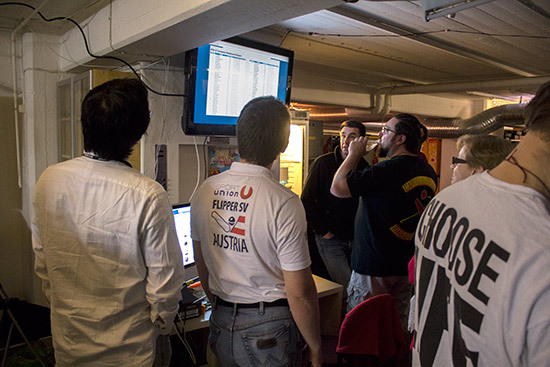 As the tournament progressed the initial rankings were discarded in favour of the current standings, and the separation between players would reduce so that by the last rounds players were competing against similarly-placed opponents. 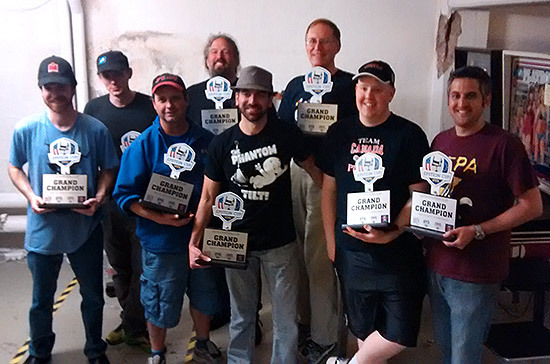 Before the first round, two awards were made. The first was to the player who scored the most WPPR points in the previous calendar year. This went to Trent Augenstein who amassed 1446.43 points in 2014. The second went to the player with the highest IFPA ranking at the end of 2014, and that was Jorian Engelbrektsson. Then the groupings for the first round were announced and score sheets handed out. Once all the groups had been announced and they had been given the names of the machines they had to play, round one began. The first two rounds lasted until lunchtime, then there was a one hour break after which rounds three and four took everyone to dinner time. 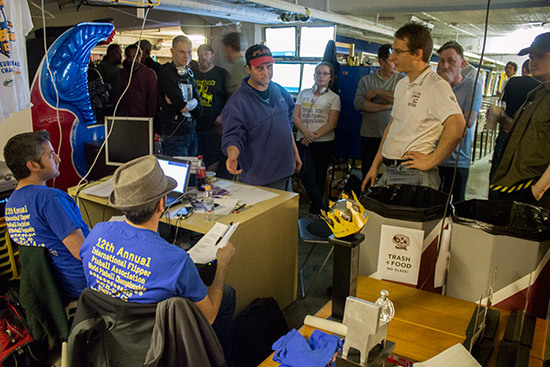 Rounds five and six ended Friday's play, sending competitors back to their accommodation knowing what, if anything, they needed to do in Saturday's last two rounds to qualify in the top 32. For some, the job was all but done, while for others it was all but impossible. For the majority though, two good rounds on Saturday morning would be enough to creep above the cut line which was expected to be around 96-98 points. Anyone in the top eight received two byes in the play-offs, and those in positions 9th to 16th received one bye. After the eighth qualifying round on Saturday, anyone with 98 points or more had qualified. There were eight players on 96 points but only four qualifying places, so those eight had to enter a play-off to see who would get through. After lunch, the sixteen qualifiers without a bye began head-to-head best-of-seven matches. The winner progressed, the loser was out. If the match got to be tied 3-3 it became a best-of-nine match instead. The eight winners were joined by qualifiers ranked 9th-16th for a second round of play-offs using the same format. Cryss Stephens was the sole non-European, representing the USA against three Swedes, one Italian, one Dutchman, one Swiss and one Spaniard. 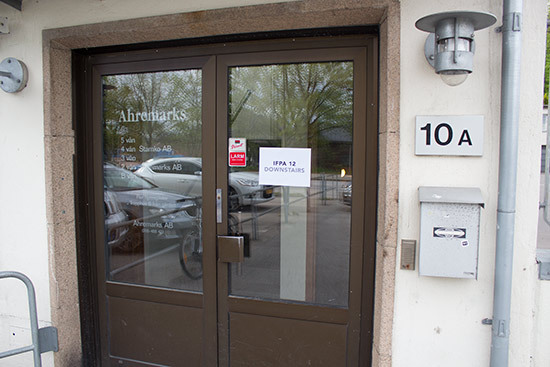 Pretty soon it was an all-European affair, as Cryss, Michael, Albert and Jorgen all lost in the quarter-finals. 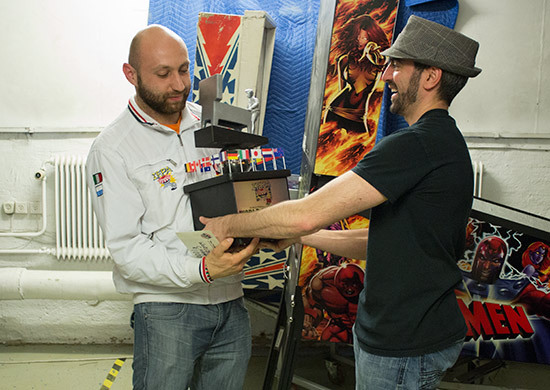 The final would be a two-player match, so there was a semi-final round in which Mats and Daniele were victorious and made it to that final. Jorian and Julio played a best-of-three match to decide which of them took third place. In the end, Jorian triumphed on both Dracula and Radical! to take third place, leaving Julio in fourth. 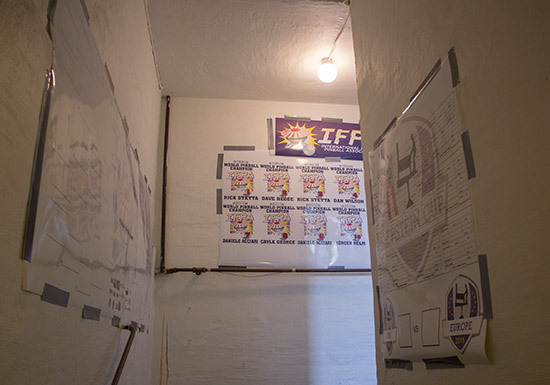 Meanwhile, preparations were underway to broadcast each game of the final on the internet. Patrik Bodin was in charge of the webcast which used three cameras. These were moved between machines, or if the distance was too far, the machine was brought within range of the cables. When everything was in place and correctly configured, the two finalists could begin game one of the best-of-seven final. 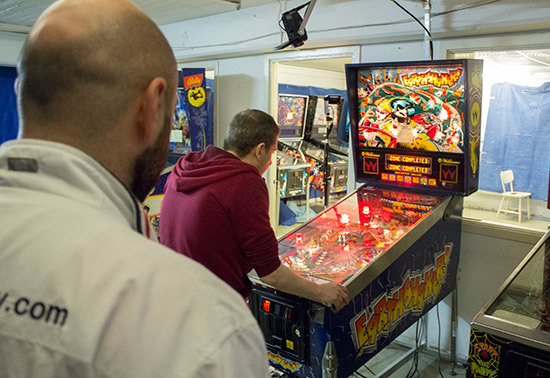 Mats began well on his chosen machine, with an extended Coffin Multiball to end on 7.117M. Daniele meanwhile has a bad start, with a quick drain and a ball one score of just 0.263M. Mats got the kind of ball Daniele has as he drains with just one more shot needed for his second Coffin Multiball. Daniele gets his first Coffin Multiball on ball two and ends just behind Mats on 6.253M. 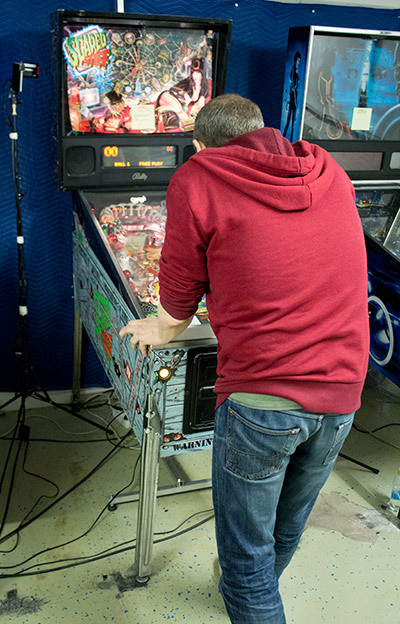 On his third ball Mats starts his second Coffin Multiball after starting double scoring from the spider wheel, but only manages on jackpot before his game ends on 9.995M. 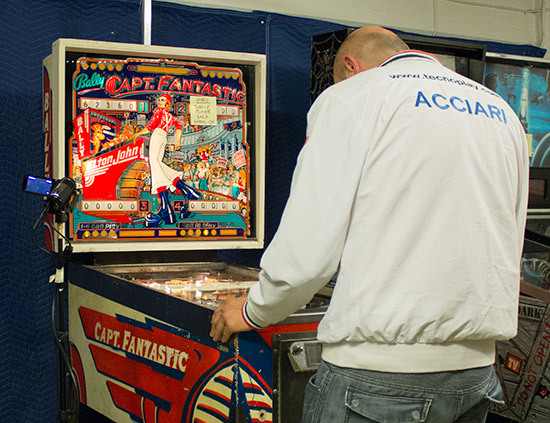 Daniele opts to extend and start Crate Multiball which takes him past Mats score, stopping on 10.857M to take the first game. Game two was on Daniele's choice of Radical! Radical! was played as a single-player game to avoid stolen locked balls. Mats began again. His first two balls were unspectacular, raising his score to 2.437M and then 3.937M. But his third ball was much better, scoring the Mega Millions award and pushing his score up to 12.735M. Daniele chose Radical! for a reason, as could be seen when his first ball scored 4.356M despite getting a double tilt warning, and his second took him past Mats' total with 15.494M and a ball to spare. Back to Mat's selection, and game three was Earthshaker! Mats got into his stride on Earthshaker!, with a solid 8.327M on his first ball. Daniele hardly got to flip his first ball, scoring just 107K. The pressure was piled on with ball two as Mats bumped up his score to 13.494M, while Daniele could only lock one ball before a drain ended his second ball. Although he suffered an instant drain, Mats' bonus miles and fault visits increasing his lead, ending his game with a nice 15.843M total. 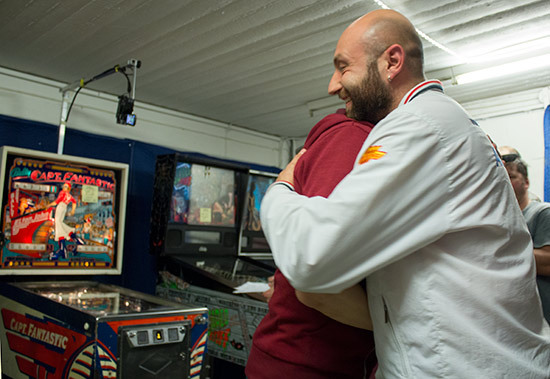 Daniele started multiball, but after collecting the jackpot his ball headed for the outlane with just 3.560M scored. Metallica was Daniele's choice, although he must have thought he's chosen poorly after a shot to the electric chair was heading straight down the middle and he tilted the game trying to save it. 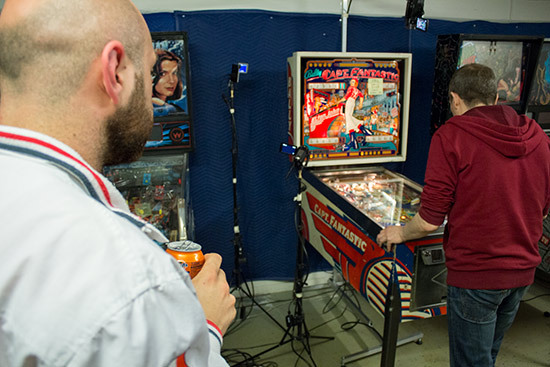 The misery was compounded when Mats started Electric Chair Multiball and racked up 20.698M on ball one, compared to Daniele's 405K. The tables were turned on ball two though, as Daniele played two Electric Chair Multiballs and started Crank It Up mode, selecting Fade to Black as the featured song. The mode didn't last long, but he raised his score to a respectable 52.880M. After a double warning when trying to save his second ball, Mats' very next shot headed straight between the flippers, giving him no means to save it and only increasing his score slightly to 20.957M. A quick drain ended Daniele's game on 53.694M. Mats started his second Electric Chair Multiball and looked set to mount an assault on Daniele's total when all the balls drained in rapid succession, leaving him with just 28.932M. Next came Mats' choice of Gorgar. If Daniele could win this he'd win the final. 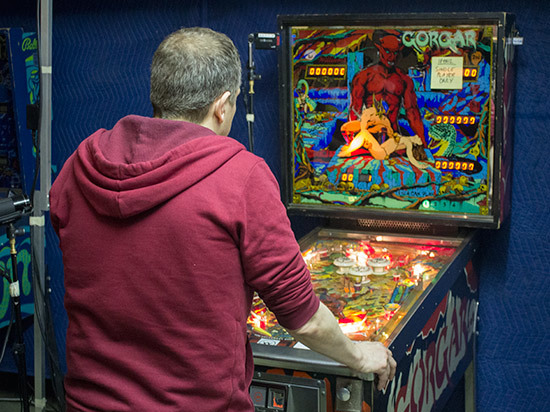 Like Radical!, Gorgar was played as a single-player game. 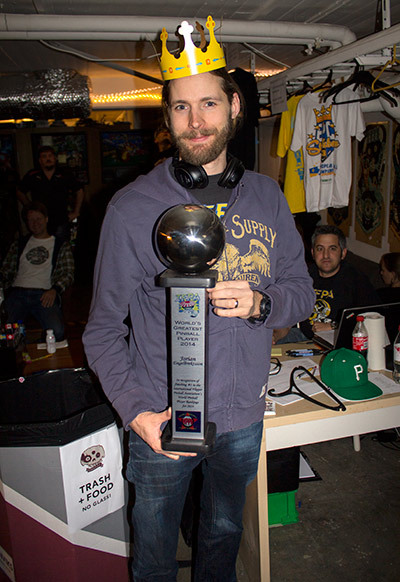 Mats began, as after a rapid bounce off a flipper and down the middle on ball one, he increased his score from 3,000 to 22,600 on ball two, and then collected the Pit award to end his game on 80,130. Daniele's game was much more consistent, scoring 18,600 on ball one and 37,940 on ball two. Another ball like the first two wouldn't be enough to take the win, but that's what he got, ending short of Mats' score on 66,500. Mata Hari was the sixth game of the final. 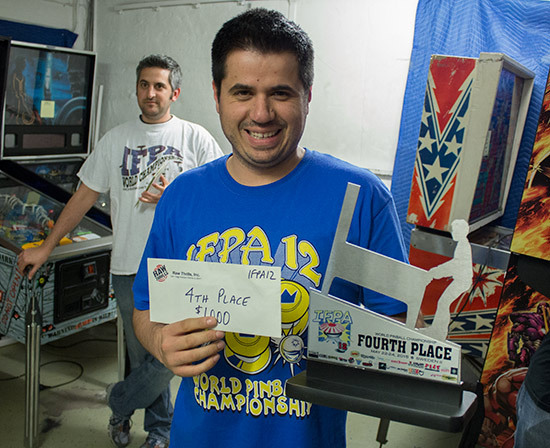 Daniele chose it, and if he could win then he would take first place and be IFPA World Champion. If not, the score would be tied and we'd be facing up to three more games. It was an unpromising start for Daniele, with a quick drain only giving him 2,800 points. By contrast, Mats has a good first ball and scored 114,830. Daniele's bad game continued as he tilted trying to save a centre drain with only 10,300 scored. Mats was unforgiving and played a great ball with 5x bonus and all the drop targets down to finish on 430,490. Daniele really needed a ball just like Mats'... and he got it. He got all the same awards and ended with 441,080. That slender lead would only survive if Mats had a very quick third ball, and he didn't. 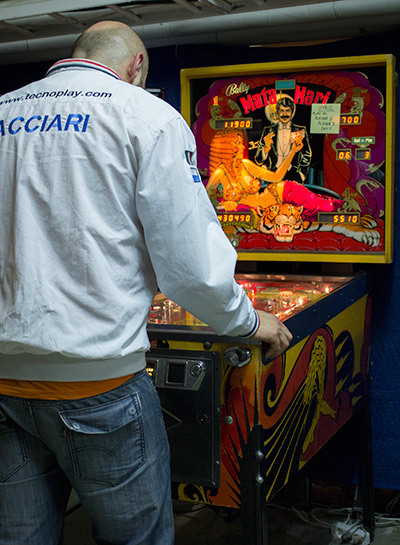 He quickly passed Daniele's score to win the game and level the score. 3-3 and into extra time with two more games added. The final now effectively became a best-of-nine. No more games would be added if there was a tie at 4-4. With a few people checking their phones and making sure they weren't going to miss their flight home, X-Men was the next game of the final. Mats began but only scored 1.52M on his first ball. 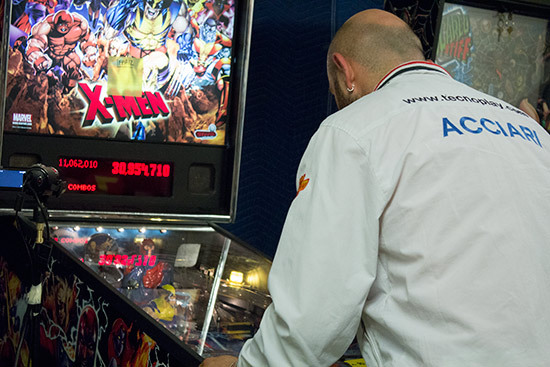 Daniele did somewhat better with his ball one total of 11.086M, thanks to a Weapon-X Multiball. 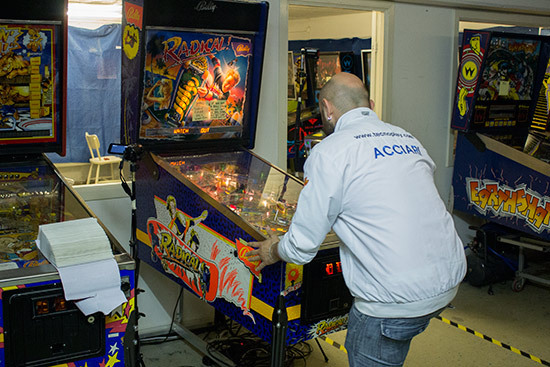 Mats took the same route as Daniele and started Weapon-X multiball on his second ball, getting a very similar score of 11.062M. 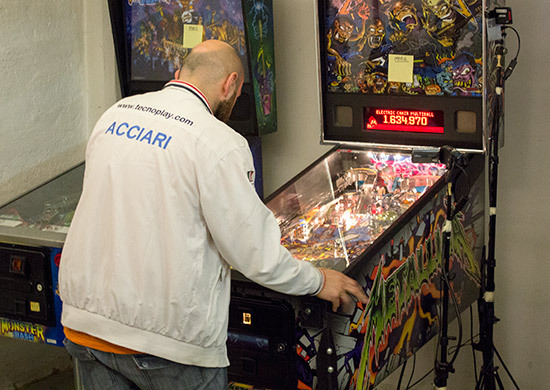 Daniele begins Magneto Multiball and plays it well, pushing up his score to a more respectable 57.895M. He needed a good ball, but Mats didn't get one. A quick drain ended the game with Mats on 11.266M and Daniele having a ball to spare. On to game eight which was Capt. Fantastic and the Brown Dirt Cowboy. 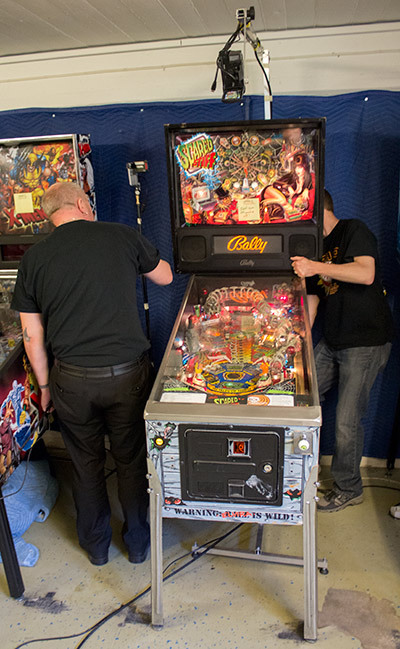 It was played as a single-player game, set to five ball with extra balls enabled, with Mats going first. A good first ball gave Mats 22,620 - a score he didn't improve upon much with his second ball, ending on 25,590. Ball three was even worse with almost no score, but things picked up on ball four as he collected all the top rollovers for a total of 59,710. The fifth and final ball only provided a marginal lift, giving Mats a game total of 67,210. It wasn't a huge target, but the game had already showed how unpredictable it could be. Daniele had an average first ball, scoring 13,630 and putting him on track to match Mats' score. Ball two derailed those plans though, as a fast drain gave him a total of just 15,150. Ball three was a marked improvement, as he kept it in play for a long time and drained with 59,860 on the score reels - almost the same as Mats' ball four score. With the title in his sights, ball four needed to perform, and perform it did. He sailed past Mats' score with a ball to spare, stopping playing on 87,730. Daniele wins the final 5-3. In fourth place was Julio Vicario Soriano from Spain. 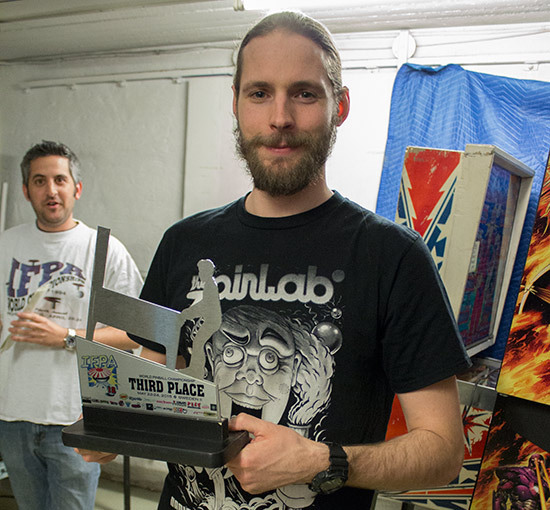 In third place was Sweden's Jorian Engelbrektsson who collected his laser-cut trophy. As we've just seen, the runner-up was fellow Swede Mats Runsten who collected the trophy for his second place. 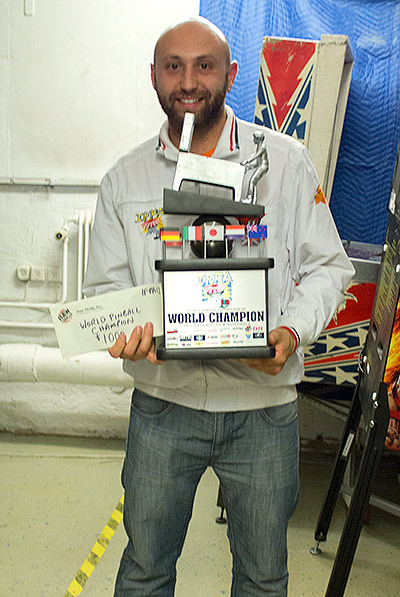 The winner - for the third time, having first won in 2010 and again in 2012 - was Daniele Acciari from Italy. 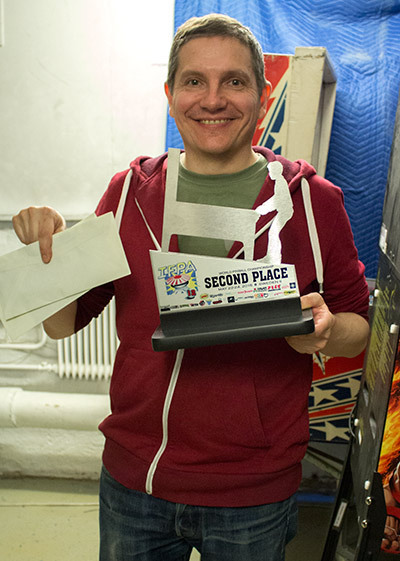 Despite the low basement ceiling, there was just enough headroom to wear the trophy as a crown. 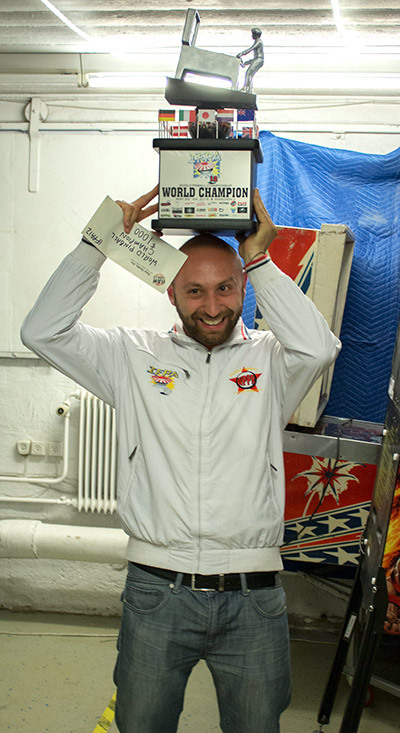 It had been a final worthy of a world championship, with two very evenly matched combatants putting on a good show for the audience both in Borås and worldwide. In fact the whole event went smoothly thanks to the hard work by the organisers. In the play-off between the losing quarter-finalists for 5th to 8th places, Jorgen Holm took fifth place. Albert Nomden was sixth, Cryss Stephens seventh and Michael Trepp eighth. And that brings our report from IFPA 12 to a close. Big thanks to Christian for being such a welcoming and unflappable host throughout the tournament week. 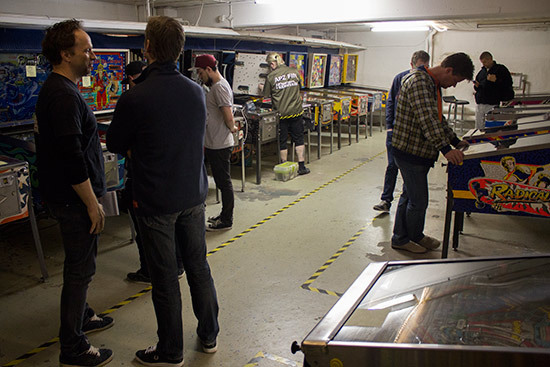 Pinballseye is certainly Borås's and possibly Sweden's best kept secret. 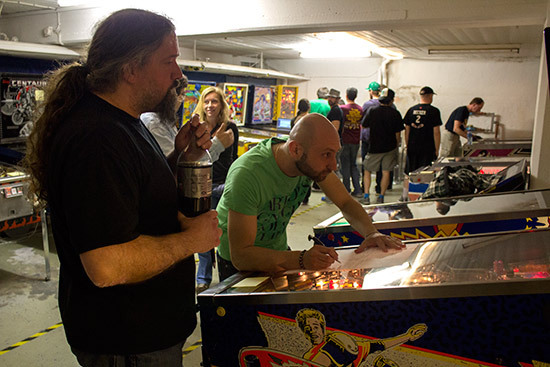 Even the locals in bars and restaurants we spoke to didn't know about it or the fact 64 of the world's top pinball players had been there all weekend. 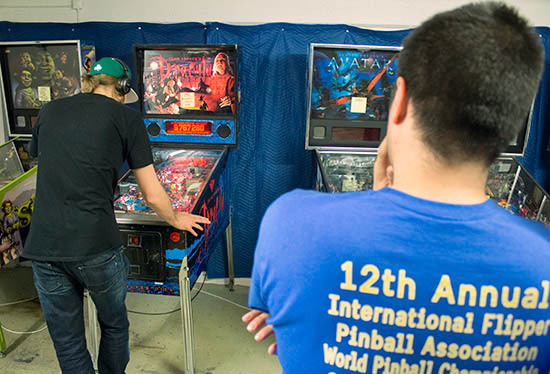 Next year the IFPA World Pinball Championship heads for Pittsburgh. See you there.